This well presented two bedroom, semi-detached townhouse is located on a small friendly development in the popular village of Chloraka. Village amenities including shops, restaurants and bars are close by and Paphos Town and the beautiful coast are only a few minutes drive away. The accommodation features a bright living room including lounge, dining space and corner fitted kitchen with useful breakfast bar. With two sets of sliding doors opening out to a spacious terrace overlooking the garden, the room is flooded with light. The kitchen is well equipped and appliances include built-in oven, electric hob, fridge/freezer and washing machine. From here a doorway leads to a small shaded terrace and private low maintenance garden at the rear of the property, bordered by trees and shrubs. A guest WC is situated at the foot of the staircase which leads up to two double bedrooms, hallway linen cupboard and family size bathroom. Both bedrooms have their own private balconies with stunning pool and sea views. The complex is very well maintained and communal facilities include a kidney shaped swimming pool and surrounding sunbathing terrace, pool shower and beautiful landscaped gardens. Parking is also available. 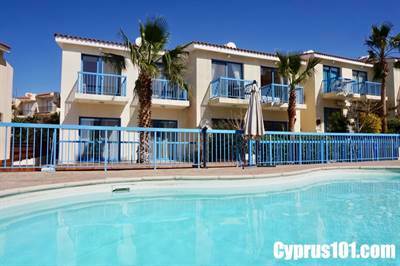 This property is suitable as both a permanent residence and holiday home/rental investment. It comes fully furnished and has full title deeds.